The impact of diacerein, an effective cartilage targeted therapy that is used in patients with osteoarthritis, on the development and progression of chronic inflammatory arthritis was evaluated in a tumor necrosis factor (TNF) transgenic mouse model (Tg197). The response to diacerein at 2, 20, or 60 mg/kg daily, as well as the comparative effects of other antiarthritis drugs including dexamethasone (0.5 mg/kg daily), methotrexate (1 mg/kg three times weekly) and an anti-TNF agent (5 mg/kg weekly), were assessed in the Tg197 mice. Treatment was initiated before the onset of arthritis and was continued for 5 weeks. A significant improvement in clinical symptoms was found in all three diacerein treated groups in comparison with untreated groups. Confirming these data, semiquantitative histopathologic analysis of the hind paws revealed a significant reduction not only in cartilage destruction but also in the extent of synovitis and bone erosion in diacerein treated groups in comparison with untreated groups. At the most effective dose tested (2 mg/kg daily), diacerein inhibited the onset of arthritis in 28% and attenuated the progression of arthritis in 35% of the Tg197 mice. Comparative analyses showed diacerein to be more potent than methotrexate but not as effective as dexamethasone or anti-TNF agents in suppressing the progression of the TNF mediated arthritis in this model. These results indicate that diacerein has a disease modifying effect on the onset and progression of TNF driven chronic inflammatory arthritis, suggesting that the prophylactic or therapeutic potential of diacerein in patients with RA should be further examined. Rheumatoid arthritis (RA) is a chronic inflammatory disease characterized by progressive destruction of cartilage and bone, leading to functional decline and disability. Tumor necrosis factor (TNF) is recognized as a central pathogenic molecule in RA because blockade of TNF in human RA patients has been shown to retard joint damage significantly [1, 2]. Experimental animals overexpressing human TNF develop synovitis with accompanying destruction of cartilage and bone structures [2, 3]. This murine disease resembles the destructive polyarthritis of human RA and can be prevented by administration of anti-TNF agents  as well as by IL-1 receptor blockade . Diacerein, a drug with IL-1 inhibitory activity in vitro [5–8] and in vivo , has been shown to be effective in the treatment of osteoarthritis (OA) [10–12] – a degenerative process of the joints that is characterized by the progressive destruction and erosion of the cartilage. Diacerein belongs to the anthraquinone class of compounds. Use of diacerein in animal models of OA [13–15], as well as in the spontaneous polyarthritis model in male NZB/KN mice , revealed that it consistently moderates cartilage degradation. Oral administration of diacerein to patients with hip OA was associated with symptomatic improvement and a significant structure modifying effect, coupled with a good safety profile . In the present study we investigated whether diacerein, in addition to its action on OA, is effective in treating chronic inflammatory arthritic diseases using the TNF driven transgenic mouse model of arthritis . A comparative analysis of the effects of diacerein and those of known antiarthritic agents including methotrexate [17, 18], dexamethasone [19, 20] and an anti-TNF agent [21, 22] in the progression of the TNF driven inflammatory arthritis was performed in parallel. The heterozygous Tg197 transgenic mouse was generated and described previously by our research group . Briefly, Tg197 mice carry a human TNF transgene with its 3'-untranslated region replaced by a sequence from the 3'-untranslated region of the beta-globin gene, allowing deregulated human TNF gene expression. By age 4 weeks, all human TNF Tg197 mice spontaneously develop a severe bilateral, symmetric, erosive, and disabling polyarthritis similar to RA. All animal procedures were conducted in accordance with the principles of the Declaration of Helsinki. Diacerein (Verboril) was provided by Laboratoire Medidom S.A. (Geneva, Switzerland), dexamethasone was purchased from Merck & Co., Inc. (West Point, USA), methotrexate was purchased from Lederle Parenterals Inc. (Puerto Rico, USA), and the anti-TNF antibody CB0006 was kindly provided by Celltech Ltd (Slough, UK). We conducted one large study in transgenic mice (n = 65) separated into eight groups: group 1 was left untreated (n = 10); group 2 received an injection of water daily (n = 10); group 3 received 2 mg/kg diacerein daily (n = 9); group 4 received 20 mg/kg diacerein daily (n = 8); group 5 received 60 mg/kg diacerein daily (n = 10); group 6 received 1 mg/kg methotrexate three times weekly (n = 6); group 7 received 0.5 mg/kg dexamethasone daily (n = 6); and group 8 received the antihuman TNF antibody CB0006 at 5 mg/kg weekly (n = 6). Each transgenic mouse received either oral administration of an aqueous solution containing diacerein or intraperitoneal administration of the rest of the tested compounds at 2 weeks of age (i.e. before the onset of arthritis). Body weight and arthritis scores were recorded weekly for each mouse. Arthritis was evaluated in ankle joints in a blinded manner using a semiquantitative arthritis score ranging from 0 to 3: 0 = no arthritis (normal appearance and grip strength); 1 = mild arthritis (joint swelling); 2 = moderate arthritis (severe joint swelling and digit deformation, no grip strength); and 3 = severe arthritis (ankylosis detected on flexion and severely impaired movement). At 7 weeks of age all mice were killed and the hind ankle joints were removed for histology. Ankle joints were removed from the transgenic mice and were fixed in 10% buffered formalin overnight, decalcified in 30% formic acid for 4 days, and then embedded in paraffin. 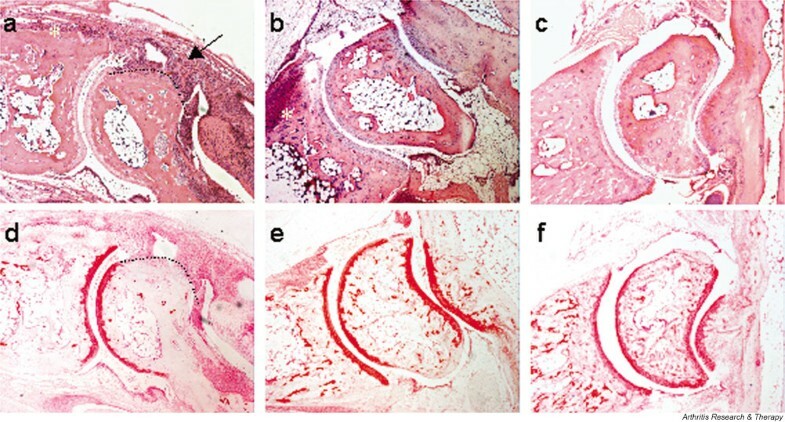 Sections were stained with hematoxylin and eosin, and the histopathologic score was evaluated microscopically, as described previously , in a blinded manner using a modified scoring system as follows: 0 = no detectable pathology; 1 = hyperplasia of the synovial membrane and presence of polymorphonuclear infiltrates; 2 = pannus and fibrous tissue formation and focal subchondral bone erosion; 3 = articular cartilage destruction and bone erosion; and 4 = extensive articular cartilage destruction and bone erosion. The extent of synovitis, cartilage destruction, or bone erosion was based on arbitrary scores described extensively below, which we use regularly in our laboratory when scoring this TNF model of arthritis. Synovitis was evaluated using a semiquantitative scoring from 0 to 4: 0 = normal; 1 = mild synovial hypertrophy (< 5 cell layers) with few inflammatory cells; 2 = moderate synovial hypertrophy (< 20 cell layers) with accumulation of inflammatory cells into intrasynovial cysts; 3 = pannus and fibrous tissue formation; and 4 = pannus and fibrous tissue formation on both sides of the ankle joint. Bone erosions were scored from 0 to 4 as follows: 0 = normal; 1 = mild (focal subchondral erosion); 2 = moderate (multiple subchondral erosions); 3 = high (as above + focal erosion of talus); and 4 = maximum (multiple erosions of tarsal and metatarsal bones). Cartilage damage was evaluated on the two ankle joint bones, tibia and talus, after staining of tissue sections with safranin-O (BDH Laboratory Supplies, Poole, UK). Proteoglycan depletion and matrix erosion are associated with cartilage degradation, as can be revealed by loss of safranin-O staining. Cartilage damage was scored semiquantitatively from 0 to 4: 0 = intact; 1 = minor (< 10%); 2 = moderate (10–50%); 3 = high (50–80%); and 4 = severe (80–100%). All values are expressed as means ± standard error. Arthritic scores and histologic scores were analyzed using the Mann–Whitney U test for nonparametric data. P < 0.05 was considered statistically significant. We tested the efficacy of diacerein in preventing the development of pathology in the Tg197 transgenic murine model of RA, in which inflammatory polyarthritis is clinically detectable at 4 weeks of age, with swelling and deformation of the ankle joints. 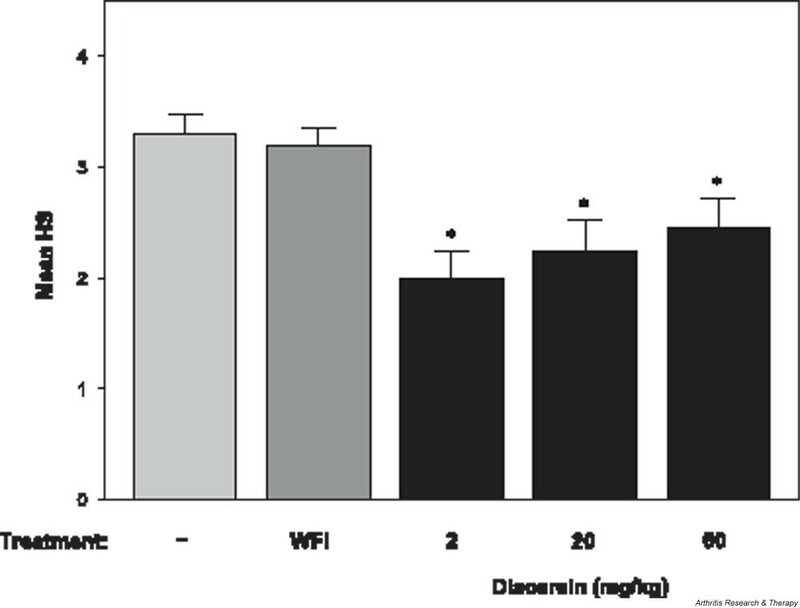 Daily administration of diacerein at doses of 2, 20, or 60 mg/kg to Tg197 transgenic mice from age 2 weeks (before the onset of arthritis) to age 7 weeks significantly reduced clinical scores compared with those in untreated mice (Fig. 1). Whereas the clinical arthritis score increased progressively in the control groups, the score was less in all groups treated with diacerein at the end of the study (i.e. at age 7 weeks), indicating a marked suppression of disease progression (P < 0.05). The majority of joints from mice treated with diacerein (69–89%) developed low to mild arthritis (arthritis score ≤ 1), whereas in the untreated mice only 25% of the joints exhibited similar arthritis scores, with the remaining 75% having scores greater than 1 (Table 1). 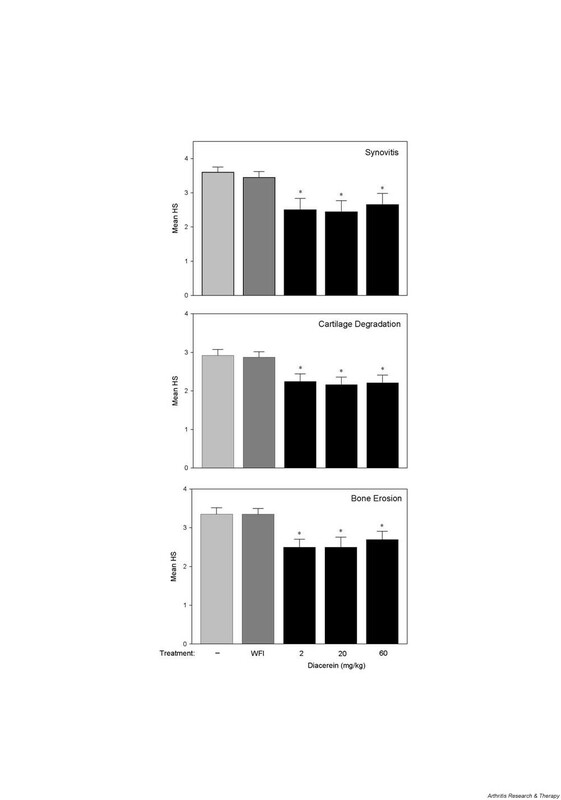 No significant differences were observed in body weight gain in treated mice during the study (data not shown), indicating that dosages of 2–60 mg/kg diacerein daily are not associated with adverse toxicity. Treatment with diacerein suppresses arthritis progression in Tg197 mice. Clinical arthritis scores were assessed in Tg197 mice that received diacerein at 2 mg/kg daily (n = 9), 20 mg/kg daily (n = 8) or 60 mg/kg daily (n = 10), or water for injection (WFI; n = 10), or were left untreated (n = 10). Both ankle joints of the mice were examined for clinical assessment during the treatment period. Note the significant decreases in arthritis scores in all diacerein treated groups at the end of the study (i.e. at age 7 weeks). *P < 0.05 versus control groups. Both ankle joints of experimental Tg197 mice were subjected to clinical assessment at 7 weeks of age. In the case of the methotrexate, dexamethasone, and anti-tumor necrosis factor antibody treatments (CB0006), the data shown are derived from one representative from three independent experiments. *P < 0.05 versus untreated or water for injection (WFI) treated Tg197 control groups. AS, arthritis score. To assess joint damage, histopathologic analysis of the hind paws was conducted in the diacerein treated mice. Similar to RA, in the Tg197 murine model the synovial lining becomes markedly thickened because of synovial cell proliferation and infiltration of inflammatory cells. This proliferative mass – the pannus – invades and progressively destroys articular cartilage and bone, leading to irreversible destruction of joint structure and function. Histologically, changes characteristic of chronic inflammatory arthritis develop in the hind paws of Tg197 mice from age 3 weeks. Interestingly, in the Tg197 mice that received the three different dosages of diacerein for 5 weeks there was a significant reduction (P < 0.05) in the mean histopathologic score when compared with control Tg197 groups (Fig. 2). Ankle joints in the low-dose diacerein treated mice (2 mg/kg daily) had lower histopathologic scores than did mice treated with higher doses of diacerein (20 mg/kg daily or 60 mg/kg daily), but these differences were not statistically significant. Our findings clearly show that administration of diacerein at all three doses inhibited the onset of arthritis in 20–28% of joints in Tg197 mice, which had nearly normal histologic appearance (i.e. histopathologic score 0 or 1; Table 2). Interestingly, at the most effective dose tested (2 mg/kg daily) we observed an additional inhibition in progression of arthritis in 35% of the Tg197 mice, whereas similar effects occurred in fewer mice receiving the other two doses (13% in the 20 mg/kg group and 20% in the 60 mg/kg group). Histopathologic assessment of ankle joints in response to diacerein administration. Mean histopathologic scores (HS) are shown for untreated mice (n = 10) as well as for mice treated with water for injection (WFI; n = 10) or diacerein at doses of 2 mg/kg daily (n = 9), 20 mg/kg daily (n = 8) and 60 mg/kg daily (n = 10) for 5 weeks. *P < 0.05 versus control groups. Histopathogic score (HS) was evaluated on ankle joints of untreated or treated Tg197 mice at age 7 weeks. In the case of the methotrexate, dexamethasone, and anti-tumor necrosis factor antibody treatments, the data shown are derived from one representative from three independent experiments. *P < 0.05 versus untreated or water for injection (WFI) treated Tg197 control groups. To assess specific effects of diacerein in synovitis, cartilage destruction and bone erosion, we conducted a semiquantitative scoring analysis for each of these pathologic parameters. Interestingly, administration of diacerein at 2–60 mg/kg daily in Tg197 mice resulted in a significant reduction (P < 0.05) in all three analytical histopathologic scores as compared with those of control Tg197 mice, which all developed synovitis with severe articular cartilage degradation and bone erosions (Fig. 3). These findings indicate that diacerein exerts its disease modifying effects mainly by suppressing inflammation and synovial hyperplasia, which are seemingly the initiating pathogenic events leading to further tissue destruction. Fig. 4 shows the beneficial effect of diacerein on joint structure in representative tissue sections from ankle joints exhibiting the lowest histologic scores in diacerein treated and control groups. Preservation of the ankle joint structure can only be observed in diacerein treated and in anti-TNF treated Tg197 mice. Synovitis, cartilage degradation, and bone erosion histology scores in diacerein treated and control Tg197 mice. Semiquantitative analysis of ankle joints reveals a protective effect of diacerein in all three individual parameters of arthritis. *P < 0.05 versus control groups. HS, histopathologic score; WFI, water for injection. Histopathologic assessment of joint destruction. Representative histologies of the ankle joints from experimental Tg197 mice displaying the lowest histopathologic scores in their group are shown here. Mice were treated either with (a, d) water for injection (WFI), (b, e) 2 mg/kg diacerein daily, or (c, f) 5 mg/kg anti-TNF antibody (CB0006) weekly for 5 weeks. Paraffin joint sections were stained with hematoxylin and eosin (panels a, b, and c) or safranin-O (panels d, e, and f). Arrow indicates synovial hyperplasia, asterisks indicate subchondral bone erosion, and the dotted line indicates cartilage degradation. Original magnification: 40×. The disease modifying effect of diacerein in Tg197 mice, as assessed by clinical and histopathologic analysis, was compared with that of anti-inflammatory agents (i.e. dexamethasone, methotrexate, and an anti-TNF antibody) that are used in patients with chronic inflammatory arthritides, including RA. Findings of semiquantitative clinical assessment based on arthritis scores of the ankle joints of untreated or treated Tg197 mice are shown in Table 1. Of the ankle joints of the untreated mice, 75% had moderate to severe arthritis with obvious digit deformation and less strength on flexion (arthritis score > 1). In contrast, only 11% of the joints of the mice treated with low dose diacerein and none of the joints of mice treated with dexamethasone or anti-TNF had a similar score, whereas in mice treated with methotrexate 50% of the joints were affected by the same degree of arthritis. A significant difference (P < 0.05) in arthritis score was observed between all diacerein treated groups, as well as dexamethasone or anti-TNF treated groups, and the control groups (Table 1). Histologically, more than 80% of the joints of the untreated control groups and of the methotrexate treated group were moderately (histopathologic score 3) to severely (histopathologic score 4) damaged by the expansion of synovial pannus and destruction of cartilage and bone structures (Table 2). In contrast, fewer than 50% of the joints of diacerein treated groups and none of the joints from mice treated with dexamethasone or an anti-TNF antibody had a similar histologic appearance (histopathologic score ≥ 3). Ankle joints from mice treated with diacerein, dexamethasone, or an anti-TNF antibody had significantly lower histopathologic scores (P < 0.05) compared with those from untreated or methotrexate treated Tg197 mice. RA is a chronic polyarthritis that leads to joint destruction and serious disability. Despite the use of a variety of medications, treatment of RA is not fully effective in most patients and side effects frequently limit their long-term use. Classic nonsteroidal anti-inflammatory drugs are used to control the symptoms of RA but they are associated with significant gastrointestinal toxicity, including a risk for potentially life threatening gastroduodenal perforations, ulcers, and bleeds . Therapy of RA with slow acting, disease modifying antirheumatic drugs such as methotrexate, which is generally accepted as the standard for long-term treatment, leads to a significant amelioration of symptoms but does not stop joint destruction [17, 18]. Glucocorticoids, which are among the most potent and clinically important immunosuppressants, are used to control acute and severe flare-ups of joint inflammation, but they are not used for chronic therapy in most patients because of their significant adverse effects. Novel therapeutic agents such as monoclonal antibodies, cytokine receptor–human immunoglobulin constructs, or recombinant human proteins have been tested in RA and in other chronic arthritides such as ankylosing spondylitis or psoriatic arthritis with convincing evidence of success. In particular, clinical trials testing anti-TNF agents, either alone or in combination with methotrexate, have proven the feasibility and efficacy of these novel approaches [21, 22]. However, therapy that is directed against TNF and IL-1 is clinically effective in only 40–70% of patients, and importantly TNF antagonist therapies have been associated with side effects including tuberculosis , listeriosis , lymphomas , and life-threatening histoplasmosis . The numbers are not high, but clinical vigilance is necessary to minimize the risk. Treatments that are directed against osteoclasts such as osteoprotegerin have shown great promise for the prevention of bone destruction in experimental models of RA  but that therapy does not affect the inflammatory tissue or symptoms of the disease. Diacerein is an effective and well tolerated agent for the treatment of OA [10–12] and it is unique among current anti-OA products in that it is able to influence both the anabolism and catabolism of chondrocytes. The effect of diacerein in chronic inflammatory arthritis was investigated in the present study using an established TNF-mediated murine model of RA – the Tg197 mouse . Invasive growth of a hypertrophic synovial membrane and local accumulation of inflammatory infiltrates are typical features of RA and arthritis in TNF transgenic mice, and are considered to be prerequisites for cartilage destruction and bone erosion. The Tg197 model has been extensively used by various research groups in the past as a reliable tool to assess the efficacy of potent antiarthritic compounds, as well as to investigate the mechanisms that are involved in the pathogenesis of chronic inflammatory arthritis [29–31]. The results of the present study clearly demonstrate that diacerein has antiarthritic activity, preventing the onset and suppressing the progression of joint pathology, as shown by clinical and histopathologic assessment of mice treated with three different doses (2, 20, and 60 mg/kg diacerein daily). 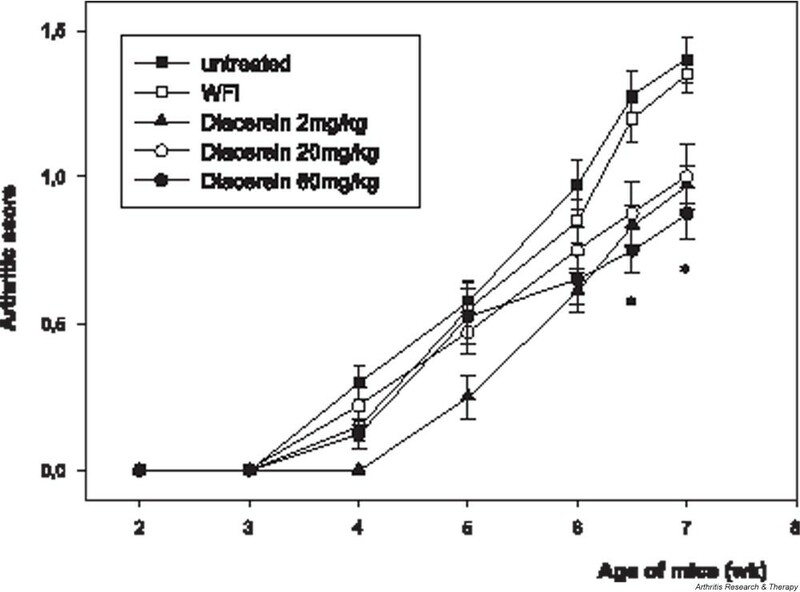 Additional studies evaluating the effects of diacerein at 4 and 40 mg/kg daily showed a beneficial response that was clearly reproduced in the present study (data not shown). Although pharmacokinetic studies were not performed, the lack of a dose effect suggests that the beneficial response can be achieved even with the low dose of 2 mg/kg daily, which is analogous to the dose used in humans with OA [10–12]. The lowest effective dose of diacerein is yet to be assessed in the TNF transgenic model. Our findings revealed a beneficial effect of diacerein not only for cartilage protection, which is usually the target of diacerein in OA studies, but also for synovitis and bone erosion. Preservation of the joint architecture after diacerein administration appears to be mainly due to the significant suppression of the highly proliferative pannus-like tissue, which consists of synovial fibroblasts, synovial macrophages, and various infiltrating inflammatory cells. This is the first report providing evidence for anti-proliferative and anti-inflammatory effects of diacerein in an inflammatory model of arthritis. In OA studies it has been shown that diacerein exerts its protective action by down-regulating the production of cartilage degrading enzymes [8, 32, 33] through inhibiting the IL-1/IL-1 receptor system and increasing the production of tissue inhibitor of metalloprotease-1 , whereas it activates cartilage repair in OA by stimulating the production of transforming growth factor-β . In the Tg197 transgenic model of RA blockade of IL-1 receptor signaling prevented disease onset, indicating that in TNF transgenic mice the IL-1 receptor acts as a potent downstream mediator in the pathogenesis of chronic arthritis . Therefore, a possible mechanism to account for the attenuation of TNF mediated joint damage by diacerein could be its inhibition of IL-1 production and hence of the downstream events that lead to production of reactive oxygen species, nitric oxide, and matrix metalloproteases. Quantitative analysis of the local production of cytokines such as IL-1 or transforming growth factor-β in joints of diacerein treated transgenic mice could probably confirm such a hypothesis. The anti-inflammatory effect of diacerein is linked to mechanisms that have not yet been completely clarified. Recently, Tamura and coworkers  reported anti-inflammatory activity of diacerein in acute inflammatory models such as carrageenin, zymosan, and dextran induced paw edema, as well as in adjuvant induced arthritis in rats. In addition to its anti-inflammatory effects, diacerein reverses the change in bone metabolism that is seen in ovariectomized rats, and maintains bone mineral density by improving the balance of bone formation and bone absorption . Our finding that diacerein significantly reduced synovitis, cartilage destruction, and bone erosion points to a beneficial effect of diacerein on multiple cell types that are involved in the pathogenesis and progression of arthritis. The cell type which is the best target for the antiarthritic effect of diacerein in TNF mediated arthritis remains to be studied. Comparative analysis showed that diacerein administration in the Tg197 model of RA for 5 weeks was more potent than the 'slow acting' disease modifying agent methotrexate. Even high dose methotrexate treatment (1 mg/kg given three times weekly) could not modify the progression of joint destruction in Tg197 mice (Tables 1 and 2). One possible explanation for the beneficial actions of methotrexate in RA is diminution of both the size and reactivity of the T cell population . The unresponsiveness of the Tg197 model to methotrexate administration could be due to the minimal role of adaptive immunity in the development of arthritis in TNF over-expressing transgenic models [38, 39]. However, it has been shown that methotrexate, at doses analogous to those used in human regimens, is not particularly effective in collagen induced arthritis either , indicating the potential incompatibility of animal models and human RA. On the other hand, diacerein was not as effective as dexamethasone. Dexamethasone administration (0.5 mg/kg daily) resulted in a dramatic suppression of inflammatory synovial tissue and in preservation of cartilage and bone structures (P < 0.05). Histologically, 100% of the mice treated with dexamethasone had nearly normal histologic appearance (Table 2). Previous studies have shown that the AU-rich region of TNF mRNA is required for inhibition of TNF translation by dexamethasone . In the present study dexamethasone was expected to block TNF production partially (e.g. in the Tg197 macrophages) as a result of the absence of the AU-rich region from the huTNF transgene [3, 39]. It may therefore be postulated that the dramatic effectiveness of dexamethasone seen in the Tg197 arthritic model works through the inhibition of additional targets downstream of the TNF production. Our results clearly show that diacerein is effective in the TNF transgenic model of RA if it is administered before the onset of arthritis. It would certainly be even more informative if similar studies could be performed in Tg197 mice after the establishment of arthritis, thus providing a more accurate reflection of therapeutic intervention in the human disease. Further studies are needed to delineate the exact mechanisms of action of diacerein, as well as to determine the efficacy of this treatment in mice with established chronic disease. However, we suggest that the beneficial effects of diacerein on progression of TNF mediated inflammatory arthritis render this agent worthy of consideration for the prophylaxis of bone damage in human arthritic conditions. Diacerein is able to prevent TNF mediated structural damage in a murine model of chronic joint inflammation, as shown by significant attenuation of clinical and histologic scores. This indicates that the prophylactic or therapeutic potential of diacerein in patients with RA should be examined further. We thank Dr Sue Stephens (Celltech Ltd) for providing us with the CB0006 monoclonal antibody against human TNF. We also thank Alexia Giannakopoulou, Spiridoula Papandreou, and Spiros Lalos for excellent technical assistance. This work was supported in part by a research grant from Laboratoire Medidom S.A. Dr Peter Fernandes who is a co-author in the present study receives a salary from Laboratoire Medidom S.A. To our knowledge, there are no benefits from commercial sources for the work reported on in this report or financial interests of the authors that could create a potential conflict of interest or the appearance of a conflict of interest with regard to the work.